After that the only thing to do is to make sure that your gammon is nice and thick and that the rind is prepared for the grill. 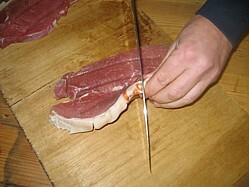 Gammon steaks have a heavy rind and when heat is applied it makes the steak “curl” and this makes for uneven cooking. To stop the gammon from curling take a sharp knife and cut into the rind every inch along the perimeter - low and behold, your steak will remain flat on the grill and cook evenly. 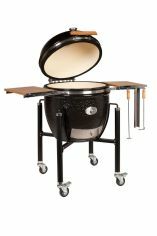 After that it's all about grilling over a nice high heat to deliver a crisp exterior and juicy meat. Using a sharp knife, slice the outer skin off the pineapple and then slice along the length into ½ inch / 1 centimetre slices – you should get about 8 chunky slices out of one pineapple. Use the knife to remove the core and make a ring. When you're nearly there top each steak off with a pineapple ring for the last couple of minutes just to warm through. 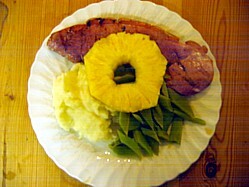 Remove the gammon and pineapple ring together from the from the grill using tongs and serve immediately. I served my barbecue gammon steaks with garlic mash and green beans. New potatoes and a nob of butter goes equally well. Note: - You can also use a bacon joint for this recipe. What's the difference? Very little apart from the price of the meat. The process for preparing bacon and gammon are exactly the same, all that differs is the cut of meat used. Typically bacon is from the back or flank area whereas gammon is cut from the rump area (back of the hind legs). Gammon is more lean whereas bacon is more fatty and it's this point that determines the price differential. 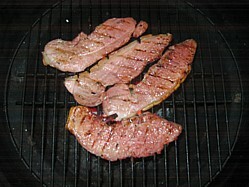 If you can get a lean bacon joint and slice it thickly to make your own gammon steaks then good for you.